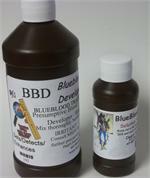 'DfS ABC' is a safe, economical variation of Amido Black Protein Stain. Ready to use aqueous solution as a blood enhancement. Amido Black is a protein stain that is used to develop or enhance blood-contaminated latent prints, footwear and tire track impressions. Amido Black is a ready-to-use pre-mixed liquid. Catalog #202B. Amido Black is a protein stain used to develop or enhance blood stained prints. Ashley's Reagent is one of our most requested blood enhancement chemicals. LCV Ehance is a catalytic presumptive test for blood formulated to set and enhance blood prints on almost any surface. Ground Ship Only. A protein stain used to enhance blood stained areas on dark or multi-colored surfaces. Liter. Ground shipment only.